Let’s continue this week with the wonderful American Science Fiction Magazine series published in Australia by the Malian Press. These Australian published pamphlets are a wonderful way for this wallet-stricken collector to purchase and read classic, quality pulp fiction stories at a fraction of the cost against what the original pulp magazine, while still retaining that “feel” of holding an old publication. Once more, we have Stanley Pitt creating an eye-appealing cover that has nothing to do with the internal contents. But we’ll forgive him. I love all of his covers. 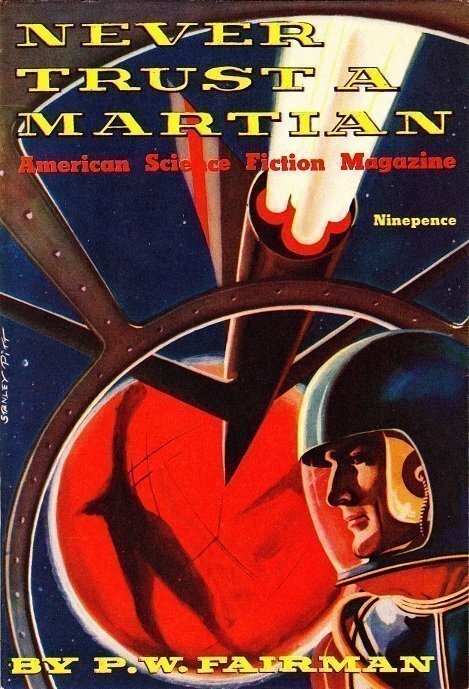 Our cover story read is “Never Trust a Martian” by Paul W. Fairman. The novelette opens with Post, interplanetary renowned super sexed-up explorer dude that has women and men alike falling at his feet (hey, that’s the impression you get, okay!) is beset upon by a trio, trying to kill him. He disarms them and learns that the lone girl assailant convinced the two thugs to give him a beating, while she intends to incinerate him for betraying her brother. Story comes about that Post thought his best friend betrayed HIM, blah blah blah, they go to investigate, have dealings with a Martian high priest, blah blah blah, story has numerous craters afflicting the plot, but is still enjoyable for 1940s-era fiction, I suppose. I won’t ruin the story by revealing the soap-opera conclusion(s). Sick and dying, Donovan is sent back in time. Fearing that the Criminal Destroyers might pursue him in Time to eliminate time-altering consequences on his part, he avoids his profession and lands in 1926. Jobless, he writes science fiction stories for the pulp market. Each decade, his aging body becomes younger and younger, and now, one year, his fiction is rejected. In fact, he has gone from old man to a very young man in appearance. Sadly, he realizes his plight and that he must return to the future to reverse the process and live a longer life again. But when he realizes that he can’t remember how to return to the future, he dimly recollects that his first pulp sale contained the exact specifics and goes in search of the original pulp editor. On arriving, he learns the editor is ill, etc, someone else in the office. The original manuscript is awaiting him, but, so is, a member of the Criminal Destroyers division…. “The Barrier” by Murray Leinster is an excellent short story. Here we have a narrator explaining the fate of Joe Harper, hero. He explains that Harper, while brilliant, was also really stupid, and knocks this Harper fellow down a peg or so, explaining the incidents that led to his demise and being put up on a pedestal to the world. Cliche ending, sure, but, it’s great stuff, and I’m simply NOT going to explain it any further than THAT, lest I ruin the story for YOU. If you are enjoying my posts for The Altus Press, you may wish to tune into The Paperback and Pulp Reader blog, covering all genres from American to Canadian to British to Australian vintage fiction. Drop in and say Hello or leave a comment. I would love to hear your thoughts and opinions on each post or suggestions for future posts!